1.1 The following conditions of sale & delivery are applicable to the sale & delivery of the products as offered on the Internet site http://www.henriduvoisin.com. Please read carefully all the conditions of sale & delivery before ordering any product on this web site. By ordering one of our products, you automatically accept the conditions as described below. 1.2 When finalizing the ordering process, please accept and validate these terms & conditions of sale & delivery. We would remind you that in case of non-acceptance of these terms & conditions of sale & delivery you will not be authorized to order any products offered on this web site. 3.1 An order of a product on this web site is considered as an offer relating to the purchase of such product in accordance with the present terms & conditions of sale & delivery. 3.2 Once the order has been placed, a message will be sent to your email address, confirming that we have taken note of your order. We would however draw your attention to the fact that this message in no way signifies that your order is accepted, as all orders are subject to the approval of the company Montres Henri Duvoisin Sarl who, prior to formal acceptation of your order, and to ensure the security of transactions and combat fraud, reserve the right to request further information formally proving your identity and your order. Should such requests not be responded to within the given timeframe, the company Montres Henri Duvoisin Sarl reserves the right to cancel your order. 3.3 Should the products ordered not be available, you will be informed of this situation by email. You will then have the option of waiting until the products become available again, or of cancelling your order. 3.4 Acceptation of your order will be confirmed by sending you a confirmation of order by email. This confirmation is then a legally binding contract between the two parties. 3.5 This contract concerns solely the products for which we have confirmed delivery in the above-mentioned confirmation of order. We are in no way obliged to deliver any other products potentially being part of your order, unless delivery of these products has been confirmed by a separate order confirmation. 4.1 The price of a product corresponds to the respective data as indicated on the web site, with the exception of obvious errors. VAT (at the current rate) is included in the indicated prices. Delivery costs are also included in the prices. Prior to dispatch of the order, the unit prices, including delivery costs, are once again indicated separately, as is the total price. 4.2 Although all possible steps are taken to ensure the accuracy of our web site, it is not impossible that certain prices published may be incorrect. Generally speaking, a check of the exactness of all prices is carried out as part of the dispatching process. Should the current price of an article be lower than the quoted price, the lower price will be the amount billed at the time of delivery of the product. Should the current price be higher than that indicated on the web site, we will either contact you prior to dispatch of the product, or we will reject your order, but will of course inform you of this situation. 4.3 We are under no obligation to deliver a product at an erroneous price (lower price), if the mistake in the price is obvious and is such that you could easily have detected the fact that the quoted price was incorrect, even if we have already sent you a confirmation of order indicating the incorrect price. 4.4 Payment can be made as described in the order process. The amount due will be indicated on the confirmation of order. Payment must be made prior to dispatch of the products. In case of payment by credit card, the amount will be debited to your bank account before delivery of the goods. We reserve the right to delay delivery of the goods until we have received full payment of the ordered products. 4.5 All credit card holders are subject to a validity control, carried out by the issuer of the card who, in addition, must authorise the card holder to use the card. The personal data of the credit card holder, necessary for these controls, can be passed on to other parties. Should the issuer of the credit card refuse to authorise payment, the delay or non-delivery of the order cannot be attributed to us. 4.6 Should the total amount of the order exceed the amount normally granted by credit card issuers, a first instalment, indicated on the web site, can be paid by credit card and is considered as a preliminary order. In the same way as an order, this type of preliminary order is considered as an offer relating to the purchase of a product in accordance with the present Terms & Conditions of Sale & Delivery. The balance will be payable by bank transfer to Montres Henri Duvoisin Sarl according to the terms indicated in the order confirmation sent to you by email. Payment of this balance is due before delivery of the products. 4.7 In the case of an order of a bespoke article, payment of a first amount defined by the company Montres Henri Duvoisin Sarl and covering the costs relating to the realization of the initial project, must be made before the initial project is carried out. Under no circumstances is this amount refundable. Should a definitive order be placed for this bespoke article, the pre-paid amount will be deducted from the final total. The estimated total cost will be specified in the quotation supplied by the company Montres Henri Duvoisin Sarl. Payment of an amount equivalent to at least 50% of the total estimated cost is required to validate the order confirmation. 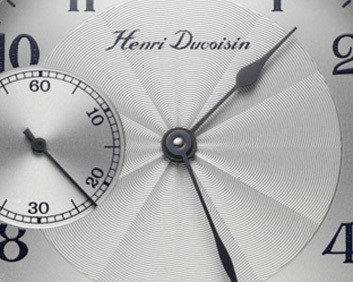 The remainder of the final total amount must be paid to Montres Henri Duvoisin Sarl before delivery of the product. 5.1 You will be informed of the delivery date by means of a delivery note. 5.2 The delivery address is that indicated on the order confirmation. For practical reasons it is sometimes preferable to ship several products from the same order at different times (split delivery). Should this be the case, it will be mentioned in the delivery note. 5.3 Should we be unable to respect the defined delivery date, you will immediately be contacted, and informed of the new delivery date. 6.1 The product becomes your property as soon as payment of the total purchase price has been made or the product delivered – whichever takes place first. We are entitled to demand the return of products at any time before the transfer of property, should you infringe the present Terms & Conditions of Sale & Delivery. 6.2 Transfer of risks is effective at the time of delivery. Risks, as defined by the present conditions, relate to the responsibility in case of damage to the product or damage caused by the use, handling or storage of the said product. 7.2 If the retraction has been carried out correctly, we will refund the price you have paid,(except for personalized or bespoke articles), on condition that the goods arrive at the company Montres Henri Duvoisin Sarl unused and in their original condition. Any costs incurred in returning the goods are for your account, insofar as the articles delivered correspond to the products ordered. 7.3 As far as bespoke products and personalized articles are concerned, Montres Henri Duvoisin Sarl reserves the right, on a case-by-case basis, to choose to grant a right of retraction, and also to fix the refundable amount. 8.1 If the product is damaged or if any sort of imperfection is ascertained, Montres Henri Duvoisin Sarl will repair the article as soon as possible – after evaluation – or will deliver you a replacement article, once the damaged or defective product is returned and received by us. 8.2 All the watches offered for sale on this web site are supplied with a 24 month international guarantee issued by Montres Henri Duvoisin Sarl, covering any defects of material or manufacture. The general conditions of guarantee can be found on the international certificate of guarantee supplied with each watch. 8.3 Claims under guarantee should be addressed to Montres Henri Duvoisin Sarl. 8.4 This guarantee in no way limits the subsequent claims under guarantee nor the right to reductions, retractions, damages and interest to which the purchaser is legally entitled. 10.1 Transfer of rights & costs. The contract established between you and our company is considered as binding for both parties, as well as for our respective legal successors. You cannot transfer, surrender, entail or in any other way make over the right to delivery of ordered products as defined in the contact, without having obtained our prior written consent. 10.2 Severability clause. Should certain provisions of the present conditions of sale be partially or completely ineffectual, the effectiveness of the other provisions remains valid. 10.3 Electronic communication. By browsing on our web site, you accept the fact that communication – in accordance with current legislation – be carried out electronically. We will make contact with you through your email address or by post, to the postal address which you have indicated to us. 10.5 The present Terms & Conditions of Sale & Delivery are subject to Swiss law. The United Nations Convention on Contracts for the International Sale of Goods (CVIM) is not valid. 10.6 Jurisdiction and applicable law. Insofar as is legally admissible, Neuchâtel is the exclusive jurisdiction for all disputes relating to these Conditions of Sale and Delivery. The company Montres Henri Duvoisin Sarl is also entitled to take legal action before the competent court of the client's legal domicile.